I hope you're having a wonderful weekend. 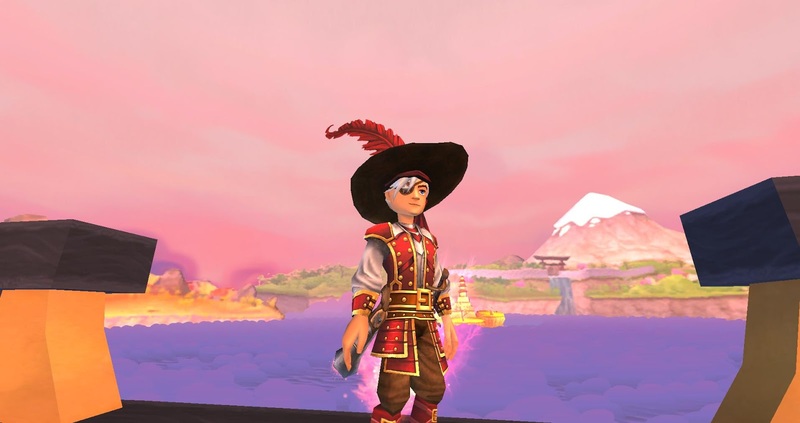 Yesterday, I was able to quest a bit in Pirate101. This time, I decided to quest one of my pirates, Edward Cringle. Some of you may know him if you have read my Swashbuckler walkthrough posts. Yesterday, I logged into my Swashbuckler for the first time in months! I was planning on continuing my main quest until I noticed the 18 pages of side quests that I had. 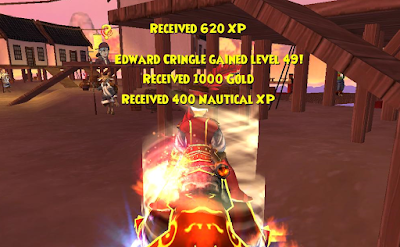 It's amazing how many side quests Pirate101 has. What's also amazing is how much side quests can level you up. I decided to put a small dent into my side quests by sinking Inoshishi Ships in the Khoton Skyway in Mooshu. I had two quests that would give me about 800 experience points combined. So I decided to start sinking as many ships that I could. One quest required me to sink 4 Inoshishi ships and the other given quest wanted me to sink 12 of these ships. It was relatively easy! A few times I did purposely enter deck battle so I could take screenshots for future posts (such as announcements), but I had no trouble sinking these ships alone. Eventually, I completed the two quests and leveled up! Mooshu is such a beautiful world. We're nearing the end, but at least I'll be ready for Marleybone!